Check out this clever, hilarious, yet sobering analysis by one of publishing’s true heroes: a brilliant bookseller. I’m a member of the Akwesasne Nation. Mohawk by birth, I’m here to tell you that working with the power who is out to destroy you will never, ever end well. As proof, I offer ten reasons why Amazon’s takeover of online retail mirrors the slaughter of Native Americans. Some tribes, upon seeing the European’s appetite for tobacco consumption, believed there was no “white problem.” Left to their own devices, Europeans would smoke themselves to death before they did any permanent damage. 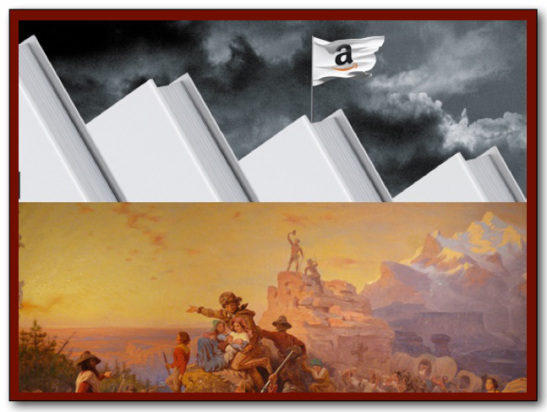 When Amazon began gobbling up book sales, some indie booksellers opined that Amazon was too large. It would overreach, expand too far too fast, and succumb to the sprightly indies who could respond more quickly to changes in the marketplace. Hey, guess what? The spry booksellers and Just Say Nohawks were both wrong. I am editorial director and publisher at Torrey House Press, a nonprofit literary press publishing fiction and creative nonfiction books that promote conservation through literature. I have a master’s in public health and previously worked at the Utah Department of Health in maternal and child health. In my previous lives, I taught piano, taught English composition at a computer science college, and raised two kids. Today, I live with my spouse, Mark Bailey, in Salt Lake City and Torrey, Utah. I blog about wild lands, medicine and pseudo-medicine, and books and publishing. Posted on June 24, 2014, in Books & Publishing and tagged books, Books & Publishing, independent booksellers, publishing. Bookmark the permalink. Leave a comment. Click here to get Torrey House Press books online from your favorite indie bookstore! Enter your email address here and you'll get a cheerful note when I post something new. Your ski bums guide to outdoor news and entertainment. Outdoors website with videos, weather, news, and stories on skiing and snowboarding.